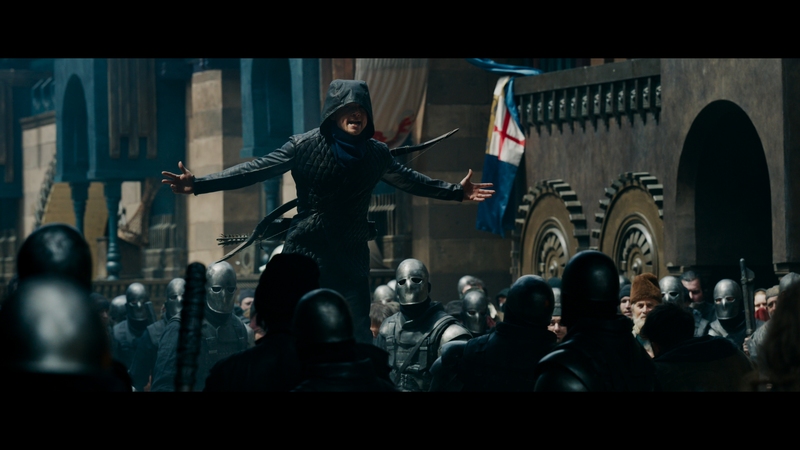 In this adaptation of Robin Hood, the Sheriff of Nottingham (Ben Mendelsohn) sustains a war with an Arabic populace by feeding citizens lies about immigration. They’ll take your land. Your religion will be replaced. Those Arabs will fight you if they cross the border. When the lies don’t work, the Sheriff sends in the middle ages equivalent of a police state, fully armored and dressed in all black. The Sheriff is angry because he was abused by priests. They hit and tortured him when he was younger. Still, the Catholic church seeks to remain in absolute power. It’s their conservative doctrine pushed onto the people. Robin Hood so wants that liberal audience. It’s desperate for it. The roots of the take/rich, give/poor fable lie in waiting, but then Robin Hood pushing everything to a laughable extreme. Rob (just Rob now) cuts a Rosary from the neck of a local priest. Later, said priest is elated at how free he now is. Rob (Taron Egerton) rides horses through the streets, dropping coins at the feet of oppressed miners. He ransacks local treasuries, slinging arrows at his foes and striking fear at those in power. 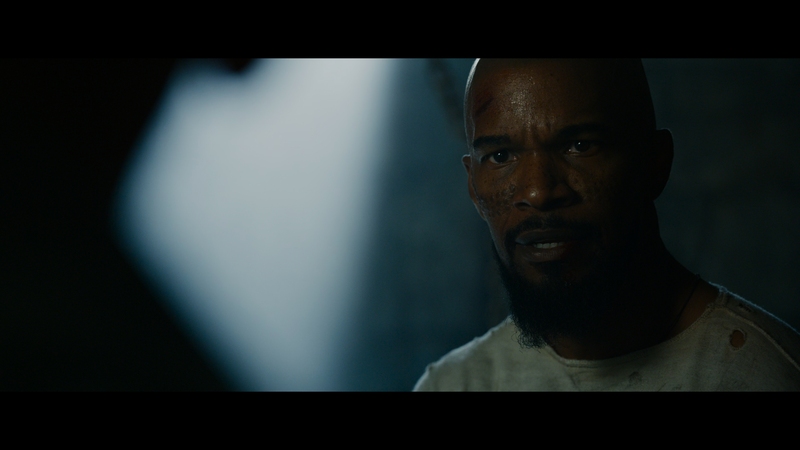 When the time comes, Little John (Jamie Foxx) gives an inspirational speech about what an inspiring force Rob became through these small acts. Now it’s up to the people to rise up. Yawn. Note Rob doesn’t start this story as a peasant who lives among inequality. He’s loaded. His house is up on a hill, or rather, not a house but a mansion. It takes war to balance things. The lack of empathy and government corruption heating this conflict turns the drafted Rob to his progressive cause. The wealth disappears, so Rob seeks to balance things out. He only becomes a hero when things directly impact his bottom line; that’s a thin hero. This thing is just a mess, blending into contemporary action cinema with a blundered green screen horse chase, derivative slow motion action, and the hokey political posturing. Egerton, who established himself in the Kingsmen series, drifts aimlessly here. Hundreds of people die in this movie, predominantly by an arrow to the chest, rapidly edited as to preserve a PG-13. In the end, all of this is for naught. The effort to brand Robin Hood a franchise, nothing is accomplished. The Sheriff position is overtaken by an equally corrupt individual, the war still rages, power-hungry Catholicism reigns, and all of the action pushed the population to live in the forest. So much for solving income equality. From a true 4K finish comes this lavishly detailed presentation, boosted by HDR10, HDR10+, or Dolby Vision depending on the system used. Put aside the fuzzier CG material, especially a number of aerial views; those take an expected hit in resolution. 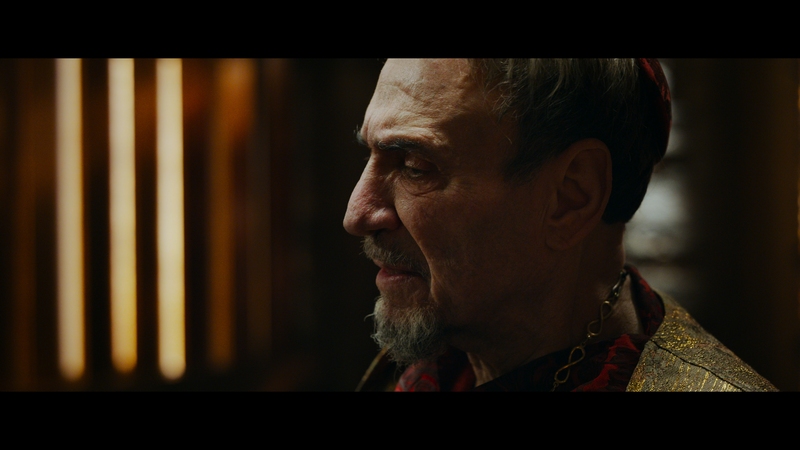 The rest is stellar stuff, enamored with facial definition from sharpened cinematography. Details in costumes stick out, and the final shots in the forest display remarkable fidelity. 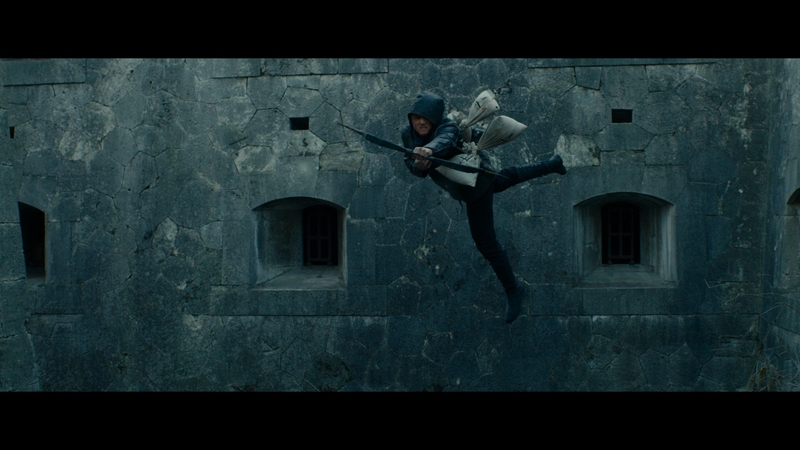 Robin Hood skews dark, but black levels produce shadows worth gawking over. True black is a constant, leading to intense depth. No loss of shadow detail is noted either. Egerton wears a black jacket and other dark outfits narrowly avoiding detail loss while maintaining dimension. Plenty of flames spurt from the mines, adding some vividness to the scenery. Church interior shots, with the backing of stained glass, push brightness to its limits. 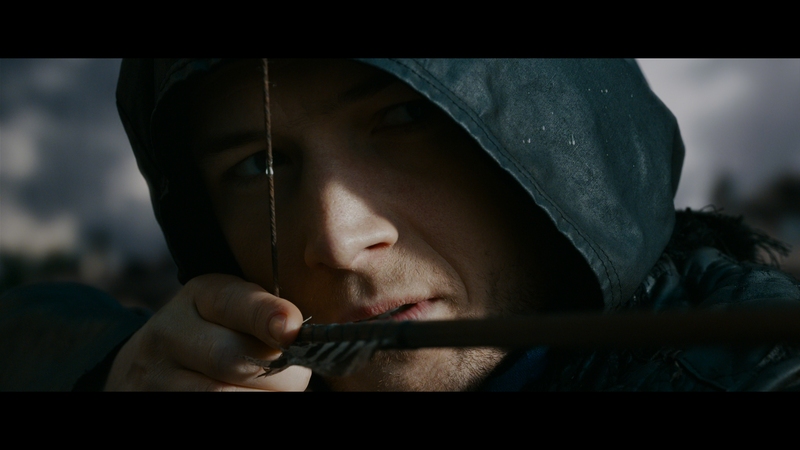 If there’s any downside to Robin Hood, it’s rather persistent low light noise. While not severe and preserving clarity, a light glaze is not uncommon. Thankfully, this won’t impact fine detail and Lionsgate’s encode keeps up without dissolving into anything worse. Note the color timing feels out of 2008 or so, with a haze of orange and teal becoming the dominant palette. That’s obnoxious. Still, that’s not a knock against Lionsgate’s disc so much as a trend that never seems to die. Black crush poses a challenge to this Blu-ray. The disc tries to see through the source’s darkness while coming away slightly injured. Egerton’s black coat makes for a convincing stealth gig, if a lackluster case of shadow delineation. When visible (and that’s most of the time) details stick out. Facial texture is consistent and strong. Sharpness likewise performs. The bouts of noise pose another struggle, but compression works overtime to keep things under control. A sensational opening battle is comparable to a World War II movie, with Rob and men charging on a turret. Arrows sweep past, sending wood falling into each channel convincingly. Each connected strike hits with a powerful jolt of LFE. Impact is sold. A few minutes later, catapults launch an assault, blasting a brick facade with awesome weight. Robin Hood’s range doesn’t enjoy being subtle. Oddly though, things die off a touch from that high. Dynamics recede slightly. Surrounds don’t receive the same prominence as they did even though arrows still fly. It’s certainly fine, a well considered Atmos mixture with scale and direction. Nothing taps on the beefiness of that intro sequence however. Outlaws and Autuers splits into two featurettes, one a general making-of that runs six minutes, the other focused on casting that drags at 21-minutes as it considers things like training for these roles. A funny blooper reel is mostly line flubs, and three deleted scenes strangely don’t offer a play all option. Robin Hood takes the classic story and casts its villain as a corrupt conservative leader without any subtly to speak of.